Guys, I’m so excited today. I wanted to keep writing every day and Katy and Meghan are so fantastic, that they were like, “Hell yeah, we’ll keep going too!” So we’re launching a weekly link up dedicated to helping you Be a Better Blogger. If you know anything about me, you know that I want to bring people together and make connections. I love that this is encouraging and elevating other bloggers. Part of that support is sharing what we’re learning. I know that I should have an editorial calendar and a list of posts that I’m committed to at the beginning of the month. The closest I’ve gotten to that is having certain themes for the days that I posted. It helps so much when you have a plan. Using Katy’s prompts in May was so helpful because it allowed me to focus my thoughts when I was writing. When you get the creative spark to write, do it. And write as much as you can to get yourself ahead of the game. Even if you end up using a different post (I’ve had 3 different posts written for today), at least you have some writing that you can pull from later. This is another thing that I know is necessary but never really did. Write everything, then work on figuring out what photos you want to take, then go in and edit them all, and finally add the correct tags and information to them. This helps so much when you can just open up Photoshop, load in a few post’s worth of photos, and plug them into the post. Then schedule away. When I get busy, the first thing that goes is updating social media. That’s why scheduling is indispensable for me as a blogger. I can write my posts and then as I’m scheduling them, I’ll queue ’em up for Tweetdeck. That way I know that I’m taking the necessary steps to have a successful blog without stressing too much during the day when I should be focusing on work. I’ve always tried to comment as much as I can, but blogging every day takes away some of the time to read other blogs. This is something I want to work on more for the following month. It’s also so valuable to have a network you can turn to for support and inspiration. If you’re out there supporting other bloggers, you’re racking up good karma points. It doesn’t go unnoticed! 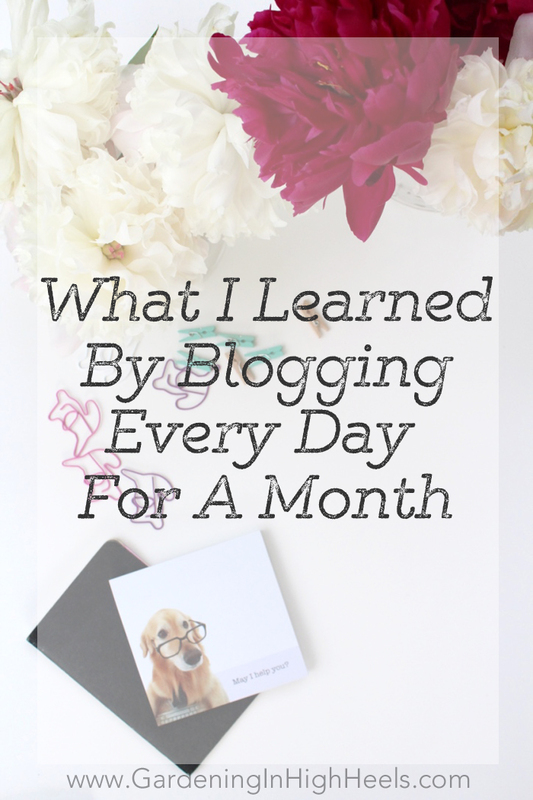 There are so many things that I learned from blogging every day for a month. It taught me a lot about time management, having a clear plan, and that batching posts is your friend. What tips do you have for being a better blogger? Be a Better Blogger is a weekly link up dedicated to helping you be a more intentional blogger. The linkups will happen on a weekly level over on the BBB page. Link as many of your posts as you’d like! Join us as we support each other to be better bloggers! How fun! Way to keep up the momentum, girlfriend! Is that a dog wearing glasses on a sticky note pad? Adorable. 🙂 Looking forward to #beabetterblogger with you! It is! My mom put it in my Easter basket. Because she may live a few states away and I may be an adult, but you’re never too old for adorable stationery from your mama!